No secret that, in the West, even particle physicist, professor and researcher at the European Center For Nuclear Research (CERN), are thrown into jail for their opinion! Indeed, not only all infectious deseases but also cancer can of course easily and without any pain be cured while continuing normal life, with the use of particle accelerators. Proton beams with carbon primer producing V particles (electron-decaying particles). Hicheur, who has consistently denied any links with terrorists, had told The Wire in January this year that he paid a price for being a highly-educated Muslim in France. “People do not understand what it means to be a Muslim or a migrant in France these days. If you are an educated Muslim and doing well, they will bring you down. I was paraded as an example of a well-educated, self-radicalized and net-savvy terrorist. They wanted to punish me for my political opinions,” Hicheur had said in the exclusive interview. ‘For Other Globalisation’ by Milton Santos to talk about the ”wicked characters” of globalisation. Adlene Hicheur supporters at a rally in Lyon in 2011, demanding his release from detention. In the guise of “national interest”, Brazil has “deported” the former CERN scientist to France, where he has been placed under house arrest. In February, just three months after a terror attack in Paris on November 13 last year, the Human Rights Watch (HRW) released a report which revealed that the French government had “carried out abusive and discriminatory raids and house arrests against Muslims under its sweeping new state of emergency law”. France was placed under an emergency by President François Hollande a day after the carnage, which left 130 people dead, to “prevent further attacks”. But, the HRW report said, the emergency powers had “created economic hardship, stigmatized those targeted, and have traumatized children” of the country’s minorities – mostly Muslims from the former French colonies. The New York-based HRW was not the only western organisation to expose the abuse of Muslims in France. An Amnesty International report, published in the same week, said that “hundreds have been left traumatised” as France had put “between 350 and 400 people under house arrest”, but “opened only five terrorism-related investigations”. Despite such damning reports from the top human rights groups, only a few media organisations bothered to investigate how Muslims in France were living in the state of emergency. While an Al Jazeera report exposed how the police was placing “restrictions on people’s movements so severely that they lost jobs and income, or suffered physically”, a TIME magazine article revealed how the new anti-terrorism power “allows police to obtain search warrants from municipal officials based on little information, rather than having to go to a judge with specific allegations”. Since November 2015, France has been on a high alert – and in a state where a person can be locked up or put under house arrest on mere suspicion of having a link with a terrorist group. Adlène Hicheur has seen this movie before. In 2009, Hicheur was working with a European Organization for Nuclear Research (CERN) laboratory in Switzerland as a particle physics researcher, when he was arrested and thrown into prison for two-and-a-half years after being accused of association with an Al Qaida terrorist. The arrest of Hicheur, a French-Algerian, caused a global sensation. “Big Bang scientist charged with terror ties,” said a headline. Hicheur, who has consistently denied any links with terrorists, had told The Wire in January this year that he paid a price for being a highly-educated Muslim in France. “People do not understand what it means to be a Muslim or a migrant in France these days. If you are an educated Muslim and doing well, they will bring you down. I was paraded as an example of a well-educated, self-radicalized and net-savvy terrorist. They wanted to punish me for my political opinions,” Hicheur had said in the exclusive interview. It was a controversial case in which he had the support of many renowned scientists and most of his colleagues. After being released from jail in 2012, he had nothing pending against him. Hicheur decided to move to Brazil to “rebuild his life and follow his passion: physics.” He arrived in Brazil in 2013 as a visiting researcher at the Brazilian Centre for Physical Research (CBPF) with the recommendation of the LHCb experiment at CERN and the director of EPFL at Lausanne, where he was working at the time of his detention. After one year at the CBFP, he passed an exam to be visiting professor at Rio’s federal university (UFRJ). His life was coming back on track. Or so he thought. After almost three years in Brazil, Hicheur’s ordeal is back to haunt him. Having been “deported” from Brazil on July 15, he is back in France, living at his parents’ house in Vienne, a pretty and historic town close to Lyon. But the beauty of the place is hardly an attraction to the scientist as he has been put under house arrest by the French police. He spends most of his time trying to understand the “trap set in the process of me being deported from Brazil to France”. In Hicheur’s mind, he has been a victim of “illegal rendition”, a situation where a foreign national is handed over by a country without the permission of a judicial authority to their home country where they could face torture or are held in breach of their human rights. In an exclusive interview with The Wire, Hicheur says he was forced to leave for France against his will, without a right to appeal. Escorted by three Brazilian federal police officers on the plane to Paris, he was delivered as if “ordered by the French police”, says Hicheur, recalling the day the police came knocking at his door in Rio de Janeiro. As soon as Hicheur went downstairs to check his mailbox, he saw a team of policemen in the building and a second team in the street. “One policeman approached me: ‘Sir, have you been informed of your deportation order?’. I said to him that it was impossible as my status was regular and legal. Then one of them answered: ‘It is a political decision coming directly from the minister of justice’, and my ordeal started all over again”. According to a statement from the Brazilian government, a “summary deportation” is an extraordinary measure that is done when “national interest demands the immediate withdrawal of an individual because of the inconvenience of their presence in the country”. It was for a reason that Hicheur did not want to go to France. To him, it was clear that he was in danger of having his freedom restricted because of the emergency laws. “I was delivered illegally to France. I asked them to send me to Algeria. My Brazilian visa was granted on my Algerian passport. It was worse than illegal deportation. I was delivered to the French,” says Hicheur, talking to The Wire over Skype from Vienne. At the Rio airport, Hicheur was not treated as someone who was being deported but as a suspect who was being sent to another country on its request. “I only found out my final destination about 30 minutes before I was taken in a car directly to the aircraft. I was accompanied by three policemen who were with me until Paris,” says the physicist. Hicheur’s Brazilian colleagues, who were present at the Rio airport through the day, confirm that he was treated as if being “delivered” by Brazil to France on request from that country. “I was shocked. It was in practice an illegal extradition without trial,” says Ignacio Bediaga, president of the National Network of High Energy Physics, who was at the airport along with the rector of the UFRJ, Roberto Leher, and the university vice chancellor, Denise Nascimento. The Brazilian police have expelled Hicheur from their country – for no reason – and the French have put him under the house arrest in their territory – again for no reason – but the scientific world continues to admire him as a brilliant mind that has made enormous contribution to particle physics in Brazil. During his stay in Rio, Hicheur impressed many with his sheer brilliance. In recent days, Hicheur worked on his second academic article in six months – a rarity. In an article for the extremely prestigious journal, Physical Review Letters, he wrote about a discovery made on the “process of disintegration of a rare subatomic particle, Bc”. When arrested first time in 2009, Hicheur got support from the community of scientists from across the world. Now, as he is caged again, top physicists are standing by him. This week, in a letter signed by more than 40 Brazilian physicists, including Ronald Cintra Shellard, the CBPF director, and Sergio Resende, a former minister of science, the teachers expressed their solidarity to Hicheur. “We express our extreme concern with the process of arbitrariness deportation since it was done without any clear justification to UFRJ, the institution with which Hicheur has a valid work contract approved by its various boards,” said the letter. The scientists are swearing by Hicheur’s research capability but in the bigger game he is apparently just a pawn. On July 15, the Brazilian federal police told him that his deportation was a “political decision”. But the note from the ministry of justice, says that the decision was based on a recommendation of the federal police, which had dismissed his application for the extension of his work permit in Brazil. This claim ignores the fact that his request for an extension of his work permit is still under consideration of the labour ministry. “At the airport, they tried in vain to make me sign a statement in which I accepted that I was illegal in Brazil,” says Hicheur. There were several other indications suggesting that Brazil was in a hurry to hand Hicheur over to the French. At the airport on July 15, even as his colleagues were running around to find his status, the federal police gave wrong information to the UFRJ Teachers Union lawyer who was trying to file a petition in the Supreme Court to challenge his deportation. Before he could move the court, the federal police told the lawyer that the flight had already departed at 10pm, despite the fact that Hicheur was still on the ground. “The plane left at 11pm,” says Hicheur. Hicheur’s “deportation” from Brazil has happened in a context. With Brazil set to host the Olympics next week, the new anti-terror law, approved by Brazil’s Congress just before President Dilma Rousseff was impeached, is coming into play. Widely criticised by human rights group, the new legislation allows anyone who is accused of committing or planning to commit crimes as minor as damage to public and private goods to be charged with terrorism. It’s no secret that Brazil adopted this law under pressure from western countries. While the debate on the Bill was going on, Brazil’s former finance minister Joaquim Levy and other members of the government had claimed the law is needed for Brazil to conform to the rules set by the Financial Action Task Force, an intergovernmental organisation founded by the G7 to combat money laundering and terrorism financing. They had argued that rejecting the law puts future foreign investments in Brazil at risk. This week, Brazil’s new defence minister confirmed that the law had been enacted under pressure from foreign governments, otherwise “Brazil could not host the Olympics”. In this global game of terror, while Brazil seems keen to show its proximity to France even at the cost of violating the human rights of a top scientist, Hicheur’s country of origin – Algeria – is in denial mode. When contacted by The Wire to find out if the Algerian embassy would protest Hicheur’s deportation from Brazil, an embassy official in Brasilia said that he was not even “registered” with them. “Mr Adlène Hicheur is not registered in the consular services of the Embassy of Algeria in Brazil and had no contact with our embassy during his stay in Brazil,” said the embassy in an email. “It’s a huge lie,” says Hicheur, displaying an official document to The Wire that clearly shows he had registered as an Algerian national at the embassy. The Algerian embassy’s response worries Hicheur as, fearing violation of his rights in France, he had requested to be sent to Algeria. “You can imagine what would be my situation in Algeria. This is very disturbing. I am afraid worse things will happen in the coming days,” says Hicheur. His fears are not baseless. Hicheur carries two passports but is almost like a state-less person. He has a work permit for Brazil, but has been forced to leave the country. On Wednesday, Hicheur’s appeal against his house arrest was rejected by a French tribunal. Now, he will be under house arrest for next six months – till the emergency is lifted in France. With restrictions on his movements and living under the gaze of police, he is feeling trapped in a situation where he fears further violation of human rights. Hicheur seems to be caught in an absurd game where suspicion and fear feed each other. In Brazil, he was seen with suspicion because of his past in France. That also probably became the basis for his expulsion from the country. Now, France is treating him like a suspect because of his deportation from Brazil. That is also the official reason for him being under house arrest. “This is a proof that this case was made with the objective of targeting me. It is to finish my future,” says Hicheur. The experience has also made him a bit bitter about Brazil, where he tried to make contribution to teaching and research. “I dedicated my whole self to honour my commitments. I had plans to create new courses on sustainable development, new energy, and treatment of cancer using proton beams and carbon ions,” he says. “And look how I am treated. All my colleagues are witness to my enthusiastic engagement in building something important in Brazil,” he adds, with a tinge of sadness in his voice. But Hicheur is not giving up on his passion: physics. He recalls the words of one of the Brazilian police officers who escorted him from his apartment in Rio to the airport. “I do not agree with what they are doing to you. I know you have an important job in our country,” the policeman told him on the way to airport. Freedom of of expression in the West? 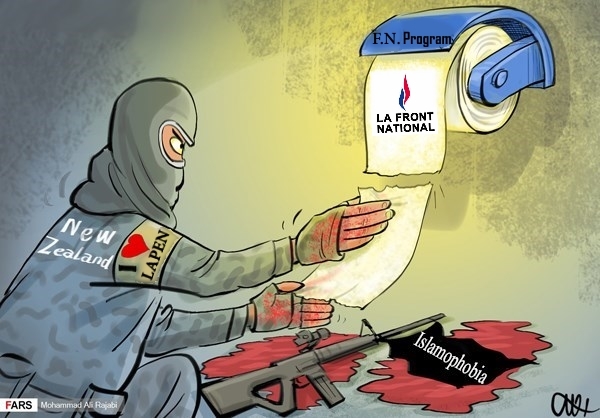 France as a notorious breading ground and exporter of genocidal racist islamophobic ideologies, better behave itself! ▲ 1. Brenton Harrison Tarrant brainwashed by French far-right islamophobic ideology: FARSNEWS.